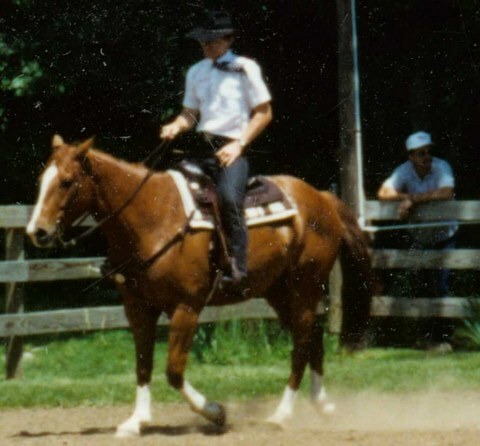 My friend Jim notified me that his long time steed – Jack – passed away last week due to stomach tumor/colic. Jack was always a solid citizen and probably would have been a heck of a ranch horse if he hadn’t lived a life of leisure being hand fed and handled every day. He was a classic, stout Two Eyed Jack horse that never had to pull a steer on the end of a rope. I remember Jim and I and his daughter Gretchen going to look at him in January 1993 – it seems a life time ago. Gretchen was a young teenager at the time. We three were in the front seat of Jim’s truck and as we rode in the truck JIm talked about the minimal requirements for the ‘purchase to be’ and Gretchen was chattering away about what kind of horse she wanted. The longer we rode the more Gretchen came up with ‘nice-to-have’ features – including Gretchen mentioning it would be nice if the horse matched her chaps and chosen stable colors. At a BHA horse club meeting that night Sue Evans gave me the punch line. Cleaning stalls that Martin Luther King day I started “Does He Poop in Just One Pile”. I think Jack managed to match up in most categories. Does He Poop In Just One Pile? To find a noble steed and bring his horse search to an end. We went to a dealer to examine all his stock. We looked each one over from his muzzle to his hock. Now, we knew exactly the type of horse we sought. If we could find that horse today he would certainly be bought. He must stand square and be conformationally correct. Be big bodied, small headed with a long and lean neck. A fluid, pretty mover exhibiting a very flat knee. He must stand quiet, act sensible and sane. For what we want this horse must have a brain. A horse that could pleasure, and lope along laid-back. Yet boldly take a jump and show in hunter hack. He must move collected, and travel in a frame. Soundness is important, he should never come up lame. Clip, tie, and load, and never show a fuss. Be suitable for the kids to ride when the relatives visit us. Do a slow western jog, and extend his English trot. Ever take the wrong lead? I should hope not! Slow lope to the left and canter to the right. Look down at a jump and tuck his knees up tight. Move off a leg; be light and flex and bend. A horse that will do all that to the Congress we would send. Stable manners must be good- a horse without a vice. Did I mention flying lead change? That would be real nice. Color is no object; there is not a bad one that I’ve seen. But keep in the back of your mind that my chaps are hunter green. We’d like to try team penning and have a horse to chase a cow. By now you know the answer; it is obvious of course. We went home no poorer, but without our perfect horse. Of steeds that we had seen and how they each did fail. We told one wise lady of our stringent criteria. She mocked us and stated our judgments were inferior. “The factors that you name account for just 10 percent. “The most important thing to ask” said she with a sly smile.